In an open lot on the Dhubat al-Saff military base, a group of Libyan rebel recruits gathers around an instructor demonstrating how to fire a Russian-made ZU-23-2 quad-barrel antiaircraft gun. At the far edge of the same lot, another trainer shows his students how to calibrate a mortar. But while the camp's instructors explain the technical specifications of their assorted weapons, Jerry Erwin of Vancouver, Wash., is teaching the recruits how to survive on the battlefield. "One, two, three, down!" the beefy soldier shouts, prompting his students to drop on their elbows. As they do, he slowly moves between them, demonstrating how to fall while still holding their rifles in a shooting position. The selling of military expertise by foreign privateers, or mercenaries, is known as the world's second oldest profession. But Erwin insists motives are more altruistic and that he is not being paid. He went to Libya in early May, he says, because he was "impressed with the Libyans' struggle against a dictator." Having served with the 101st Airborne in the 1980s, Erwin has spent the past 25 years as an Army Reserve intelligence officer specializing in counterintelligence and strategic analysis. Throughout the eastern city of Benghazi, a dozen such training camps have sprung up since the rebellion against Muammar Gaddafi began on Feb. 17 and was forced to turn to arms by the regime's slaughter of unarmed protesters. The camps were designed to give recruits a four-week crash course in basic combat skills and weapons training. 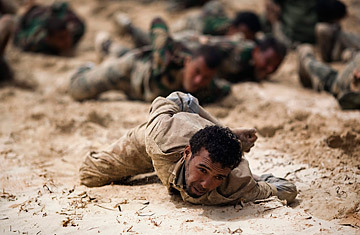 But because the instructors at Dhubat al-Saff, retired officers who served in the Libyan army, spend most of the six hours of daily training focusing on weapons familiarization, Erwin is trying to teach recruits survival techniques and unit coordination. "They have a determination that reminds me of Rocky Balboa," says the cigar-chomping 46-year-old American. "But they are missing some of the basic methods that all soldiers need." Erwin believes the rebels are spending too much time training on sophisticated weapons systems like the French Milan antitank missile recently shipped to them by Qatar. "The Milan is probably above their skill level. You need people who have a high familiarity with weapons to understand how to use the optical system, and these guys just don't have it." And with Gaddafi having pulled back his tanks after dozens were destroyed in NATO air strikes on the road between Benghazi and Ajdabiyah, missiles like the Milan are of very little use against his mobile forces using Toyota pickup trucks. The recruits are impressed with Erwin's teaching techniques and are eager to benefit from his military experience. "Jerry explains to us things our trainers neglect. Before he came, we spent most of our time taking apart Kalashnikovs," says Mahmud al-Titlawi. But not all the Libyans on the base are pleased with Erwin. The American reservist has the support of those Libyans on the base loyal to Khalifa Hiftar, the former Libyan army colonel and war hero who has spent most of the past 20 years living in the U.S. in suburban Virginia, before returning to join the rebellion earlier this year. Hiftar has repeatedly clashed with rival rebel military leaders wary of the returning exile. While troops loyal to Hiftar control part of Dhubat al-Saff, the camp commanders answer to rebel chief of staff Abdel Fatah Younis, a bitter rival of Hiftar. And they have sought to marginalize Erwin, claiming his teaching methods are not suitable for the current campaign. Distrustful of any foreigner, those commanders refused to speak either about Erwin's contribution or the training the recruits receive. Erwin has equally harsh words for his detractors. "Everybody busts their butts here while they sit in their offices. They don't interact with the camp," Erwin complains. He laments the dysfunctional chain of command and blames it for the soldiers' low morale. Some of Erwin's fellow trainers share his sentiments. "We want to train our guys to be ready to go to the front," says Fawzi al-Ubeidi, a 46-year-old former sergeant in the Libyan army who defected to the U.S. with Hiftar, and who left his home in Johnson City, N.Y., to join the rebellion. "But the commanders here want to teach us the same losing techniques that made our army a decrepit fighting force." But Erwin is too occupied with training his troops to dwell on such problems. With break time over and three cups of tea consumed, he heads back to a grassy field to instruct the fighters in concealment techniques, and how to shoot around corners. See TIME's special report "The Middle East in Revolt"